We acquired THE DEACON in 2017. Room by room, piece by piece, we refurbished the entire inn, offering contemporary luxury amid the period-appropriate details for today’s distinguishing guests. And in 2018, our efforts were recognized with acceptance into the Select Registry family of properties. Select Registry is a diverse collection of independent, boutique inns that deliver a level of personalized service and quality only a select few can attain. Each of our unusually spacious, light-filled rooms boasts a private bathroom, luxurious linens and toiletries, a flat-screen TV, and a wood-burning or gas fireplace. Our hope is that guests – from Old Saybrook to SoCal – will love THE DEACON. Located on the first floor, this is for guests who don’t like steep 19th-century stairs, or guests who like to socialize. Named for its many built-in shelves – the Library boasts a fireplace (we supply the firewood! ), fire-side seating, a private bathroom with a whirlpool tub, an inviting four-poster queen-sized bed and a flat-panel TV. All five rooms have recently been re-decorated with period-appropriate linens, armchairs, rugs and more. It doesn’t get more “New England” than this. Don’t forget – your stay includes a gourmet breakfast served in our cafe next door at our sister property, James Pharmacy. The Suite offers a large bedroom with a queen-sized bed, a working fireplace (we supply the firewood! ), a private bathroom with a whirlpool tub, and then – through the French doors – an extra bedroom with a twin-sized bed and TV. This room has just been refurbished with new wingchairs and a highboy, plus all-new rugs and gorgeous, luxurious linens. Bring the family and stay upstairs in The Suite. The Gambrel is a cozy nook, nestled between the ceiling beams (may not be suitable for tall guests!) With windows on three sides, The Gambrel is sunny and bright, yet the gas fireplace makes it cozy and warm. Enjoy a queen-sized bed, a romantic tub in the center of the bedroom, a flat-panel TV plus a small sitting area overlooking the garden. 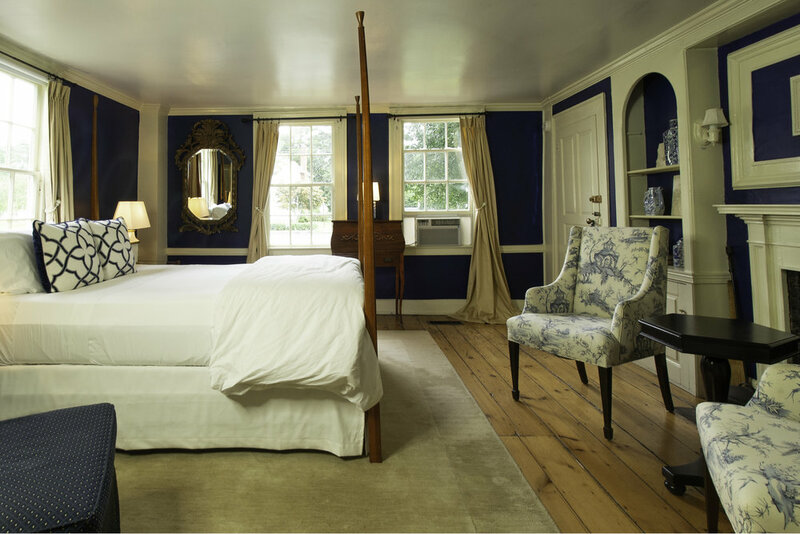 All rooms have been refurbished with luxurious new linens and period-appropriate details. The Gambrel is an intimate little getaway. This bright, airy room features a stately British Colonial air, while offering the comforts of today. 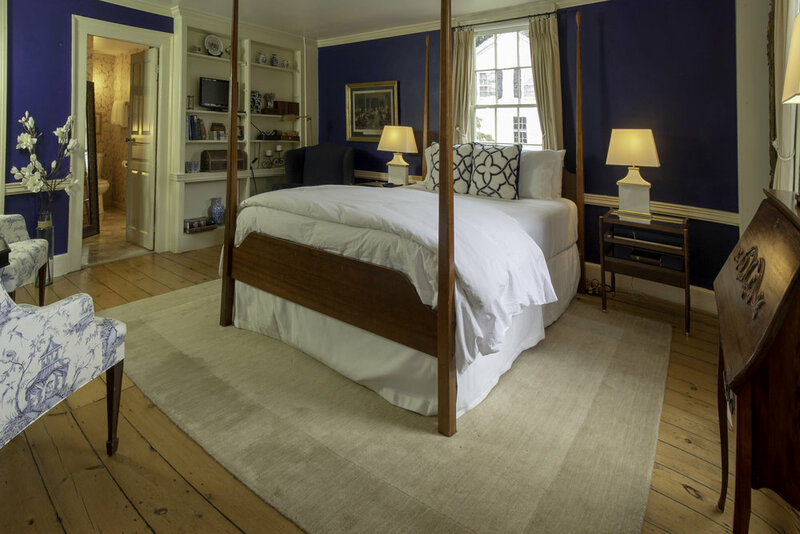 The queen-sized canopy bed is the centerpiece, but an original, working fireplace graces the room. (Yes, we provide wood!) A newly refurbished sitting area – in period style – was recently created for peaceful enjoyment. The Sunrise has a large, private bathroom with an oversized whirlpool tub and shower, plus a flat-panel TV. The Sunrise is one of the owner’s favorites! Our most spacious room occupies the whole third floor. The Treetop has a dramatic cathedral ceiling with exposed original beams. A queen-sized canopy bed overlooks a huge, 11-foot window (with window seats perfect for reading), a no-fuss gas fireplace and a flat-panel TV at your feet. Like all of our rooms, you’ll have a private bathroom – but please note the Treetop doesn’t have a tub. Perfect for business travelers or a romantic hideaway!